Another semi-parametric way to estimate this to derive splines in temperature. 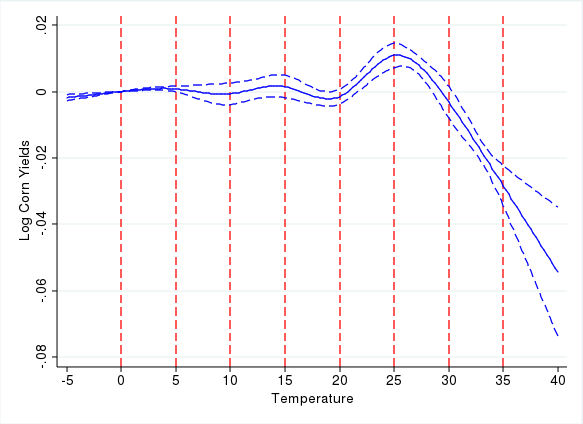 Specifically, I used the daily minimum and maximum temperature data we have on a 2.5x2.5mile grid, fit a sinusoidal curve between the minimum and maximum temperature, and then estimated the temperature at each 0.5hour interval. The spline is evaluated for each temperature reading and summed over all 0.5hour intervals and days of the growing season (March-August). So what is it good for? Well, it's smoother than the dummy intervals (which by definition assume constant marginal impact within each interval), yet more flexible than the 8th-order polynomial, and doesn't require different bounds for different crops like the piecewise linear function. 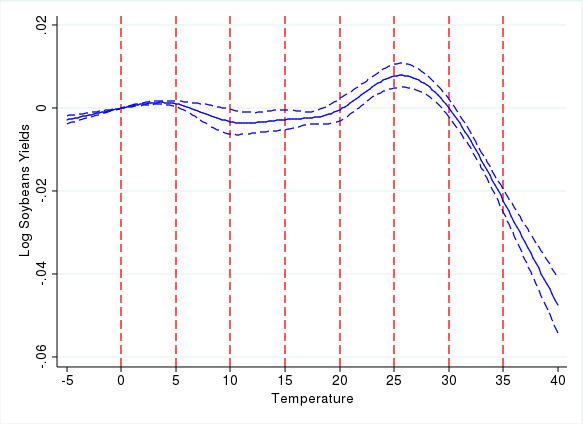 Here's the result for corn (the 8 spline knots are shown as red dashed lines), normalized relative to a temperature of 0 degree Celsius. The regression have the same specification as our previous paper, i.e., the regress log yields on the flexible temperature measure, a quadratic in season-total precipitation, state-specific quadratic time trends as well as county fixed effects for 1950-2011. A few noteworthy results: The slope of the decline is similar to what we found before: A linear approximation seems appropriate (restricted cubic splines are forced to be linear above the highest knot, but not below). In principle, yields of any type of crop could be regressed on these splines.